The most significant Indictment, concerning Ismael Zambada-Garcia was returned almost a year ago in March, 2014. At that time it named him and two of his sons, Ismael Zambada-Sicairos, aka “Mayito Flaco”, and Ismael Zambada-Imperial, aka “Mayito Gordo”. In July, 2014, a Superseding indictment was returned adding Ivan Archibaldo Guzman-Salazar, a son of Joaquin “El Chapo” Guzman-Loera. It also added some specific assets to the Forfeiture count, including a small Cessna plane, two Lamborghinis, a Mercedes and some other vehicles. The Superseding Indictment from July is here. The March, 2014 version is now unsealed and available on PACER. Nor are the other cases featured in the press release “new.” The most recent case was indicted in July, 2014, 6 months ago. Since Ismael Zambada-Garcia has pending indictments in New York, the District of Columbia, Texas and Illinois, which have been widely publicized for years, charging him in yet another district hardly seems very newsworthy – unless he’s been captured or his arrest is imminent, which I haven’t seen mentioned anywhere. So the cases are only news to the public, as opposed to being newly filed. I'm curious about why the announcement was made now, and why the U.S. Attorney in San Diego didn't mention the filing of a related case that really is new. While this new case was filed in Chicago, rather than San Diego, it provides a roadmap to explaining the charges against Ivan, the airplane and the vehicles. Which in turn makes me curious as to why this new case wasn't filed in San Diego. Secondary questions I have are why Ivan Guzman-Salazar was not charged in the initial Zambada Indictment in March, 2014, but added to the Superseding Indictment in July, just four months later. What did the Government know in July that it didn’t know in March? And what prompted the Government to add the 1982 Cessna Turbo 210, two Lamborghinis, a Mercedes and a Nissan to the July Indictment? Did the DEA make a major drug bust in July and grab the plane and cars, along with information connecting them to Ivan? Here are the details: On October 28, 2014, Jorge Martin Torres and his wife flew from Guadalajara, Mexico to San Antonio, TX intending to visit the Alamo and Sea World. He never made it to either, because he was arrested on a money laundering Complaint filed three days earlier in Chicago. The basis for the charge is the Government’s allegation that Torres arranged for Ivan and his brother Alfredo to purchase expensive cars, and a 1982 Cessna Turbo 210 single engine plane located in Ohio. This is the same plane named in the San Diego Indictment (U.S. tail number N1218U, bearing Serial #21064675, and now Mexico tail number XB-NKY.) The plane was exported to Mexico for the brothers. The Government alleges the plane was intended to be used to transport drugs and drug proceeds, and to secretly fly the brothers around so they could evade capture. A reporter with the San Antonio Express News attended Torres’ detention hearing, at which two DEA agents testified, and reported details of their testimony. They testified that Torres negotiated and completed the purchase of the Cessna and vehicles on behalf of Ivan Arichibaldo Guzman-Salazar and his brother Jesus Alfredo Guzman-Salazar. 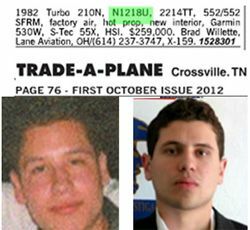 While the 21 page affidavit attached to the Complaint names Torres and the plane's seller and broker, it refers to four other individuals, two of whom were the ultimate purchasers of the plane and vehicles, only as Individuals A, B, C and D. With the DEA agent's testimony, it's now clear that Individuals A and B are the Guzman brothers. A U.S. Drug Enforcement Administration agent testified that the case has been built in Chicago by wiretaps authorizing agents to intercept emails and phone calls of cartel members or associates and information from former high-ranking members of the cartel now cooperating with the feds. The Affidavit describes Individual C as an “as yet unidentified” lieutenant of Individual B. Based on this judicially authorized interception, an email account hereafter, “Subject Account 1” was identified as an email address used by Individual C, a currently unidentified lieutenant to Individual A and Individual B….In particular, Individual A self-identified Subject Email Account 1 as his/her email in judicially authorized intercepts. In or about May 2013, Subject Email Account 1 was used to facilitate the laundering of more than $100,000 of drug proceeds to purchase a luxury vehicle in the United States. The affidavit also says the plane transaction went through Torres and the “Subject Account 1” email account. It also describes Individual D as a personal pilot for Individual B. Based on the content of electronic communications intercepted pursuant to an Order entered by Chief Judge Ruben Castillo on or about August 15, 2013, Individual D has been identified as a personal pilot to Individual B, responsible for flying Individual B and his coconspirators between clandestine airstrips in Mexico. As explained above, due to his/her status as a Sinaloa Cartel leader, Individual B cannot travel through traditional, legitimate means, so instead travels using private aircraft from hidden airstrips in an effort to avoid detection by law enforcement. This travel is required to facilitate Individual B's leadership functions within the Cartel and further its criminal activities. Curran, however, acknowledged that there appears to be no direct email contact from the Guzmán brothers to Torres. Instead, they appear to have gone through a cartel lieutenant that has not yet been identified, according to Curran and court records. In any event, Mr. Torres was denied bond and transferred to Chicago to face the money laundering charge. An Indictment was returned charging him with money laundering (along with Individuals A, B, C and D) and seeking the forfeiture of $1 million. (Case: 14-cr-00623 Document # 9, 11/20/14). Nothing much has happened since then. There's no indication he's going to plead or cooperate. What’s interesting about the plane purchase and export from a money laundering standpoint is that Torres didn’t try and hide the payments – he used his real name for the wire transfers, and he apparently never communicated directly with Ivan or Alfredo. He appears to have a legitimate construction business in Guadalajara. One of its projects involved an airport. According to the Affidavit and confirmed by public records the plane was registered to AVIATION PARTS & SERVICES CO in El Paso, which brokered the deal between Torres and the seller or his agent, Lane Aviation in Columbus, Ohio. Both are legitimate companies still in business, and there's no indication either is suspected of committing an offense. Publicly available flight tracking records show the plane was in Ohio, and flew to El Paso in February, 2013, within days of the final payments wired by Torres. The Affidavit says Torres found the plane through an ad. Here's an ad for the plane I found from October, 2012. According to the Affidavit for the Complaint, the brothers agreed to buy the plane in December, 2012, and the payments for the purchase were made by wire transfer through Torres between early January and early February, 2013. Additional payments were made to Aviation Parts and Services for repairs, customization and the cost of exporting it to Mexico through May, 2013. Putting the allegations together with public documents, here's the chronology. Here's the registration showing Aviation Parts and Services as the registered owner until February, 2013. Torres wired the last of several payments for the plane on Feb. 6. An FAA notice shows on Feb. 13, 2013 Aviation Parts & Services de-registered the plane and noted it would be exported to Mexico. During March, April and the beginning of May, additional repair and customization were done on the plane by Aviation Parts and Services. On May 31, Aviation Parts and Services submitted an application to export the plane to Mexico. The plane was registered in Mexico and the new tail number was added. On June 11, 2013, Individual D, the pilot, sent photos of the plane with the new tail number to the email account for Individuals A and B (used by Individual C) to show them the plane had been transferred. The Government’s theory for the money laundering charge is that Ivan and Alfredo intended to use the plane to transport drugs or drug proceeds and to fly around secretly since they knew either one or both of them were wanted as fugitives. It also says the proceeds used to buy the plane were drug proceeds and that by acquiring the plane for them, Torres conspired with them to further their drug business. If Torres never communicated with them directly, and only went through Individual C, their lieutenant, what evidence does the Government have he knew the brothers' intended purpose for the plane or that the funds used were drug proceeds? The search warrant results for Subject Account 1 establish that, beginning no later than December 1, 2012, TORRES, Individuals A, B, and C, and others conspired with one another to launder in excess of $300,000 of drug proceeds from Mexico to the United States to purchase, refurbish, and transfer from Ohio to Mexico, a 1982 Cessna Turbo 210 tail number N1218U (the “Subject Airplane”) in order to promote the underlying narcotics conspiracy. Does it have emails and texts between Torres and the unnamed lieutenant in which they discuss the illegal source of the purchase funds or the intended use of the plane? Or do they just have emails and texts showing that Torres knew the purchasers were sons of El Chapo? If the latter, is that enough? (Surely the family must have some legitimately owned businesses and sources of funds.) Are they also going to hit him with sanctions for doing business in the U.S. with persons on the designated OFAC list? Since they are asking for a $1 million forfeiture from him, and the plane and cars don't amount to that much, there must be something else. It's also somewhat curious that the Government says in the October, 2014 Torres affidavit that it doesn't know Individual C's identity. How could they intercept the brothers'communications from November, 2012 on and not know the names and functions of their lieutenants, especially one close enough to be entrusted with managing one of the brother's personal email accounts for an extended period of time? How do they know Individual C is the only person who communicated through the email account? What's fairly obvious from this Complaint is that Torres' arrest was no coincidence. Prosecutors filed the complaint against Torres on October 25, using an affidavit signed by the DEA on October 24, and when Torres showed up in San Antonio on October 28, agents were waiting to arrest him. It seems they proceeded from interception orders for the brothers to orders allowing them to intercept Torres' email account or his phone, and learned he would be going to San Antonio. They quickly filed the Information in Chicago — no time to wait for the grand jury — got an arrest warrant, alerted the DEA in San Antonio, and asked them to arrest Torres. That's the history of the Torres case, but it doesn't explain why Chicago, rather than San Diego, filed the criminal case against him. Especially when months earlier in July, San Diego had indicted Ivan and added the plane and vehicles to its existing Indictment against the Zambadas. And especially since the the Torres affidavit makes it clear that Torres had no connection to Illinois. Although no events in this Affidavit are alleged to have occurred in this District, venue remains proper in the Northern District of Illinois in that the money laundering events in furtherance of the same conspiracy in which TORRES is a member were reasonably foreseeable to TORRES. Based on the seizure of tons of cocaine and marijuana, as well as the seizure of substantial quantities of heroin and methamphetamine, including multiple seizures in the Northern District of Illinois, the seizure of millions of dollars of drug proceeds, including the February 13, 2014 seizure of approximately $675,851 in the Northern District of Illinois from a money laundering associate of Individuals A, B, and D, judicially authorized intercepts, and information from reliable confidential sources and defendants regarding drug trafficking and money laundering activities in the Northern District of Illinois, the cell of the Cartel operated by Individuals A and B has substantial ties to this District. The money laundering events described herein were taken in furtherance of the same drug trafficking and money laundering conspiracy which exists in this district. One is Heriberto Zazueta-Godoy, aka “Capi Beto” or “Don Beto.” Zazueta is alleged to be a Sinaloa cell leader involved with drug and money laundering offenses, now mostly related to El Chapo and his son, Alfredo Guzman-Salazar. He is on the Government’s designated Narco trafficker list. He’s also been around a long time and was alleged in earlier years to be working with the Zambadas. He was charged in 2006 in the District of Columbia in a 25 defendant case involving the attempted transport of a large amount of cocaine from Colombia on the M/v Guayacan in January, 2006. (Case 05-cr-00342 Document 9, 04/18/06.) He was allegedly the Sinaloa representative with respect to financial arrangements for the transport. He was also alleged to have been involved in the transport and seizure of 19 tons of cocaine from the M/V Gatun off the coast of Panama in 2007 (at that time, this was the largest seizure ever.) 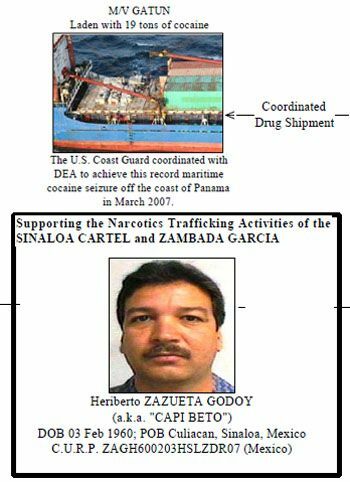 Here's a screengrab of the Treasury Notice designating him a major drug trafficker, citing his role in the M/V Gatun, and stating he was connected to the Zambada faction. There's no mention of the Guzman Loera faction in the notice. The media also reported his connection to the Zambada faction. But by 2008, according to the Chicago Indictment, he was working with both the Zambada and Guzman factions in supplying heroin to the Flores twins. Zazueta was never arrested or extradited on the D.C. charges, and the Government moved to dismiss the case against him in 2010, saying even if he were apprehended, it would take one to two years to extradite him, and it no longer had custody of the cooperating witnesses it would need to prove the charges against him. (Document 431). As to more recent money laundering activity, Count Five of the 6th Superseding Indictment in Chicago charges only Zazueta, El Chapo, and Alfredo with money laundering. The Indictment has two forfeiture counts, and Zazueta is included in both. One forfeiture count pertains to illegal drug activity and includes both the Guzman and Zambada factions, while the second forfeiture count pertains only to the money laundering charged in Count Five, and names only Zazueta, El Chapo and Alfredo. The Zambadas aren't included in this forfeiture count. Since no motions have yet been filed in Zazueta's case yet, there's not much additional information available about him. But it seems possible that that the seizure of money in late February, 2014 mentioned in Torres' complaint has something to do with Zazueta and Alfredo. If so, it's not at all clear to me why Ivan isn't mentioned or charged in the Chicago case, and why the San Diego case makes no reference to Torres or Alfredo. By October, 2014, when Chicago charged Torres, it was obviously aware that San Diego had charged Ivan in July and initiated a forfeiture against the plane and cars Torres helped the brothers obtain. Why wasn't Torres added to the San Diego case with Ivan, the Zambadas and the plane and cars? If it's because Torres was also connected to the money laundering activity of Alfredo and/or Zazueta, why did the Government file a separate case against him in Chicago, rather than adding him to the existing case against Alfredo and Zazueta? Something's missing from this puzzle. I hope someone who follows these cases more closely than I do will figure it out. I'd especially like to know why San Diego chose this week to unseal these Indictments, none of which are new, and didn't even mention the Torres arrest in October, 2014, or his Indictment, which is clearly relevant to its prize case against the Zambadas and Ivan Guzman-Salazar, and which as far as I can tell, is the only significant new case that has been brought since the last indictments in July.